Although not standard “garden” elements, my weeds are also harvested for culinary and medicinal use. 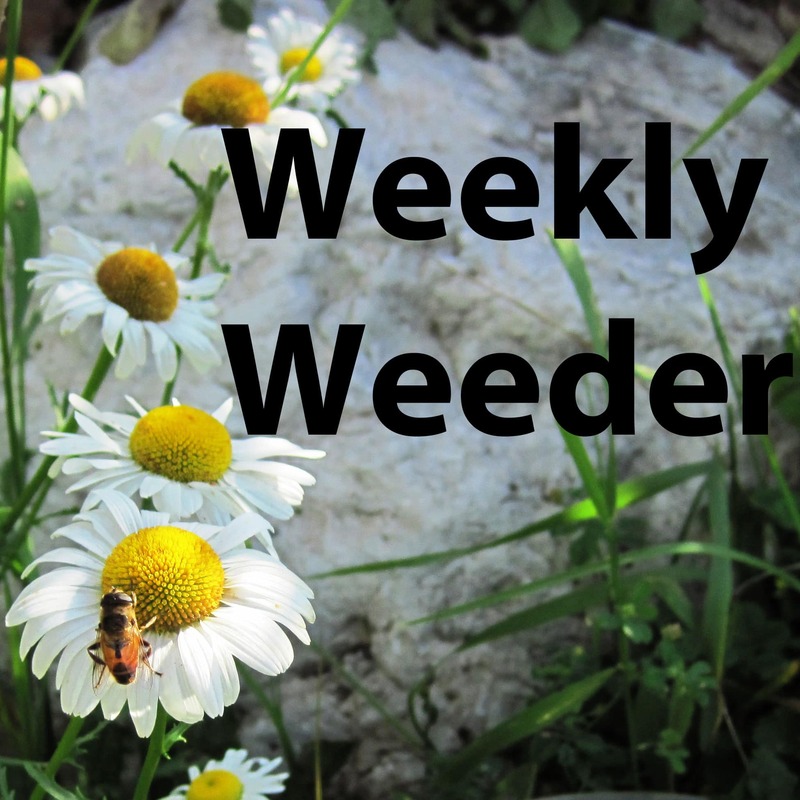 The “Weekly Weeder” series provides identification and usage information for many common weeds, plus there are articles on some of my favorite herbal recipes and remedies that are a must for every homesteader. I just rediscovered the book “Weeds- Guardians of the Soil” thanks to Phil Nauta, The Smiling Gardener. I had read a page of this book years ago, and wanted to read the rest of it ever since. Thanks, Phil! You should do a post on the Elderberry plant! Thanks for all the wonderful posts you have done so far. I am learning so much! Just looked at Queen Anne’s Lace….I happen to have tons of it here on my property! Plantain is quickly taking over my yards…some kind of tiny yellow clover that tastes like vinegar, red clover ad white…the list keeps growing! I love finding new “food” on the land that we live on! I love elderberry tincture that I make myself. Also elderberry brandy with spices and fruits, both are medicinal (and good)…wonderful when coming down with a cold or flu, or just to help prevent!! My neighbor says she knows of some elderberry stands nearby, so I’m looking forward to experimenting with blossoms this spring as well as fall fruit. The wine is lovely! I just love reading these! I have learned so much. I find myself looking at weed everwhere now. LOL. Thanks for all you do! I find myself doing the same thing. 🙂 Weeds aren’t just “weeds” anymore. 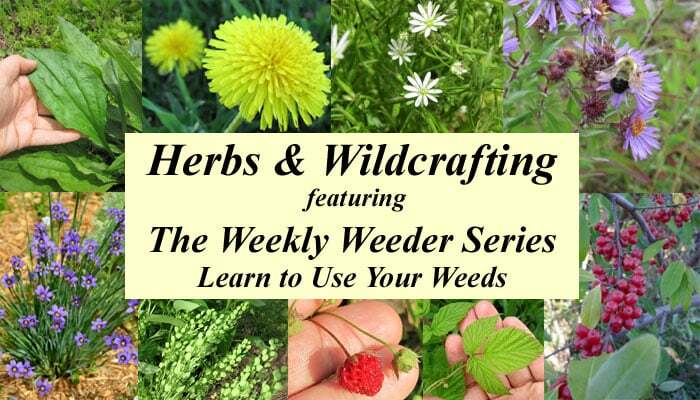 I’ve been moving more and more into organic gardening and now want to “grow” edible weeds to go with the ‘greens’ I plant. Also to attract “good” bugs and pollinators. A guy saw some mushrooms growing on my railroad toes and wanted to eat them ….. he said they smelled OK, but I wouldn’t let him do so and told him lots of preople have died from eating mis-identified mushrooms. I know mushrooms aren’t ‘weeds’ but really need to know what is in my yard that can be eaten – and – what should be avoided. I didn’t know thistle was edible. How does one get around those thorns? Is that “railroad ties”? I would not eat any mushrooms growing out of those, as they are treated with chemicals that would be absorbed by the mushrooms. One can handle thistles barehanded if one has tough fingers and manipulates them gingerly, but light gloves are helpful. You go for large plants with fat, juicy ribs, and sort of skin off the prickly outside. I’ve also munched roots of small plants as I am weeding – just rinse and go – no skinning. I need a good post or some detailed information on the look and gathering of Jerusalem Artichoke. I know it grows around here, but each time I think I have Identified it, I turns out NOT to be what I’m looking for. WikiPedia isn’t detailed enough. Have you ever seen or heard of an Herb Harvesting Calendar? 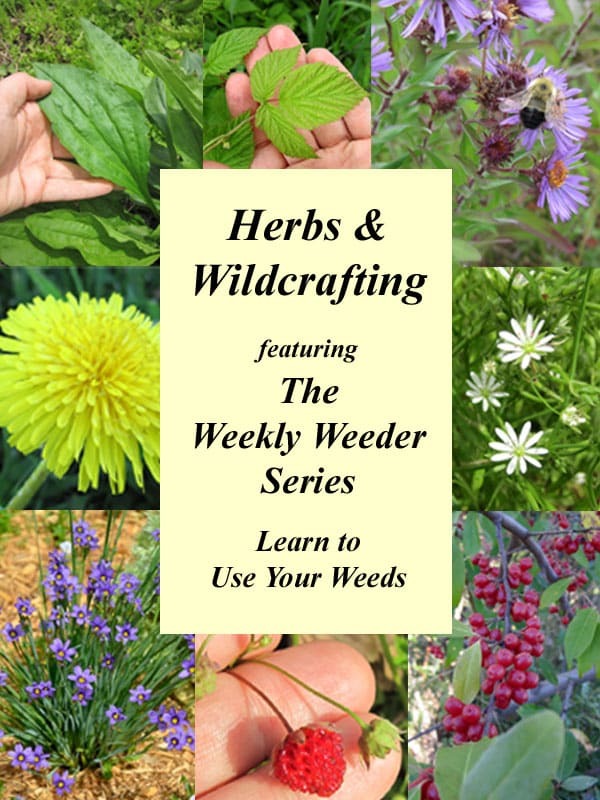 Are you talking about cultivated herbs or wildcrafted plants? I’ve never heard of a calendar like this. It would be difficult to make, either way, because harvest dates will vary by zone and even by microclimate. Thanks for the info. Its very interesting stuff. I hope to try some of it. Wow, I just gotta say thank you! The info and experience you’ve put into your life and site is amazing. Thank you. I would love to come hang out with you for one day and just watch you do some of the things you talk about. I’m a single mother of two and I desperately try to find more ways to make living affordable. I LOVE gardening and just being outside. I love the thought that I could just live off of everything I grow myself. Thanks again. Thank you, Monica. People like you are the reason I keep writing even when I feel completely swamped and overwhelmed. Life’s not all roses, but we do the best we can with what we have, and try to keep learning and doing a little more each day. I know I may be shooting in the dark here but…I saw on another blog where you guest posted on dehydrating fruits/herbs that you are a mechanical engineer by training. I am looking to build a medium scale tray dryer and was wondering if you had any previous experience in this regard or know anyone that can help guide me on building one. I am starting a small fruit drying business but the commercial dryers that I’ve seen are way out of my budget and I have heard of people building their own. Do you think you can assist me in any way? Check out the “Getting Started with Home Food Drying” post. At the bottom there are links to a number of different DIY dehydrators, including one that I think may be the sort of thing that you’re looking for. Looking forward to exploring your site more. Very nice. A while back you mentioned a board game to learn herbs….I can’t remember what it was called! Any info on having your own bees? ?? I LOVE the site Laurie! !!!!! I look forward to coming to an open house!!! Just found out about your wonderful website……went out this morning with a whole new attitude on the weeds that are beginning to show up here in early spring….I’ve got so much to learn and will be reading your back post…..I’ve signed up for your newsletter and I’m sharing it with all my friends…our mini farm never has been more exciting and appreciated….truly a gift from God…..thank you for your work and dedication….I’m planning to purchase the books you mentioned…they sound like a world full of information….I’ll be needing a dehydrator…..mine was just a cheap plastic one and didn’t even last one garden season….My grandmother use to dry all her herbs just by hanging them on the screened in back porch however I’m wanting to do fruits and vegetables….one of my friends purchased an Excalibur…I believe was the brand…..it’s electric….what is your way of drying?…do you have a store bought one or homemade…..I saw one many years ago in Mother Earth Magazine……just can’t seem to control myself…it must be common sense spring fever…Ha!!! Thank you for your kind words, your excitement and sharing the site with friends. Sometimes it gets tough to make time to keep the site going with everything else going on in life, but comments like yours remind me why I keep writing. I’ve ended up with two dehydrators – a small Snackmaster that I bought many years ago, and a more recently purchased Excalibur that I bought to handle the big drying jobs. I also sometimes hang dry some herbs when I’m doing bulk drying, like large quantities of catnip for the kitties. I know what you mean about spring fever! It’s been tough to stay inside on these warm sunny days. I have a post covering the basics of dehydrating located at: https://commonsensehome.com/home-food-drying/ It includes links to specific drying tutorials, as well as more information on equipment options. So excited to have found this blog!! Can’t wait to learn such useful information!